This coming Monday, July 23 we will be hosting an evening with winemaker Cristina Tiberio. 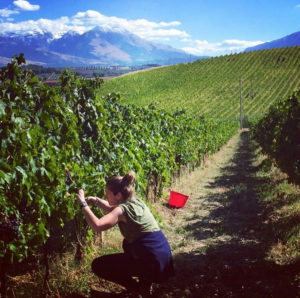 Cristina will be the in the dining room pouring four of her family’s award winning Tiberio wines and sharing more about winemaking in Abruzzo. Tiberio has some of the oldest Pecorino and Trebbiano Abruzzese vines in the region, producing wines that are delicate and light bodied while also having greater depth and complexity. Cristiana is a chemistry graduate and teaches college level winemaking chemistry and sommelier classes. She has an impressive list of training stints including Jacques Selosse in Champagne, Nicolas Joly at Coulee de Serrant, Egon Muller in the Mosel, and various producers in Chablis. She has even been “down under” to Australia’s Clare Valley. In 2011 she took over all the winemaking duties and is now solely responsible for the wines made at the estate. You can assume from her resume that structure and minerality are key to her style.